When Collin and I moved to Memphis, we didn’t expect to be here five years later. F.I.V.E!!! But, Easter 2017 was on its way, and here we were, without plans to eat dinner or see family over the holiday weekend. Holidays away from family can be really hard, but we’re usually with family for 1 or 2 of the big ones (Thanksgiving, Christmas, Fourth of July). This typically leaves Easter with a nice big question mark on the calendar. I hate being in this situation. While Collin doesn’t mind chilling at home, I’m all about the nostalgia and celebrating and traditions. When they’re missing, it just doesn’t feel like a holiday. In this situation of being far from family with a holiday fast approaching, it is tempting to get mopey and feel sorry for yourself. I’ve done my share of crossing my fingers and hoping someone invites us over for dinner, but the waiting/depending on other people/passive aggressive begging/puppy dog eye making involved in this just isn’t my favorite. So this year, we decided to host a little low key Easter potluck at our house. 5 other couples and their little munchkins came, and our menu ran the gamut! (I didn’t know “gamut” was spelled like that.) We had ham, green bean casserole (my favvvv), carbs on carbs on carbs, some beverages, and dessert provided by yours truly. Which brings me to this carrot cake. This is my first from-scratch carrot cake. (Yes (*hangs head in shame*), around this time of year, Aldi has carrot cake box mixes, and I usually buy one and whip it up). BUT NOT THIS TIME. I busted out my box grater, bought a 2 pound bag of whole carrots (We’re a strictly baby carrot family, so this was a big step), rolled up my sleeves, dreaded grating carrot for a good few days, and then finally sucked it up and accomplished the mission in less than 10 minutes. 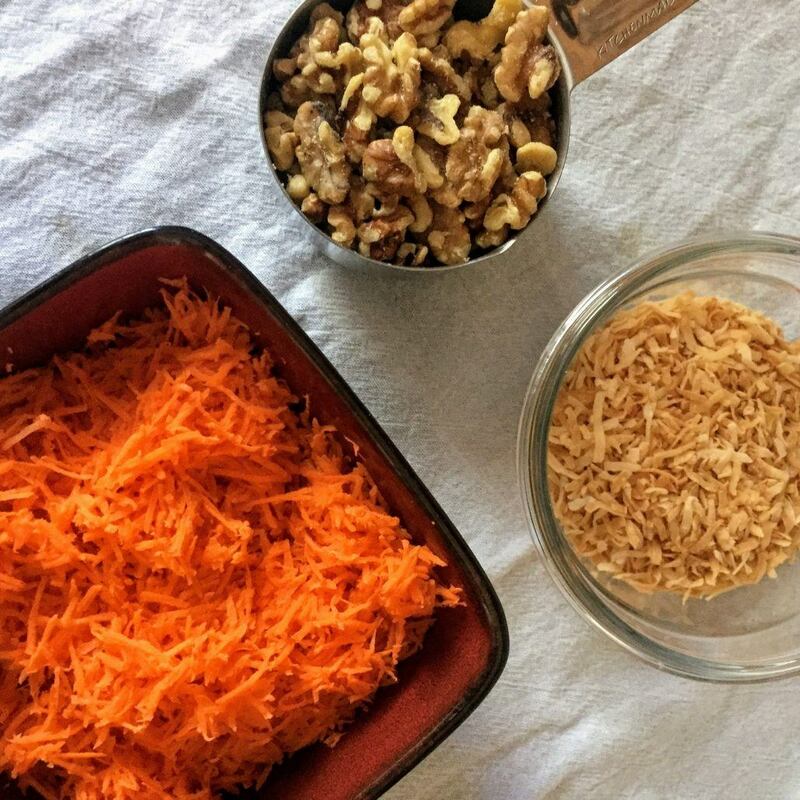 Now, because this was my first time, I stifled the side of me that likes to tamper with recipes in the name of successfully making a carrot cake, but… there will be time for returning to this recipe and doing some adventuring with it! I love the vibrant orange of the carrots in this picture. It *POPS*, and it’s beautiful! Here’s the batter before I gave it one last mix pre-oven! This is the the part where I regretfully inform you that my hopes of doing a cute little shot of a piece of cake on a plate didn’t work out. So here’s Pacman cake for ya! When you make this, let me know how it turns out! 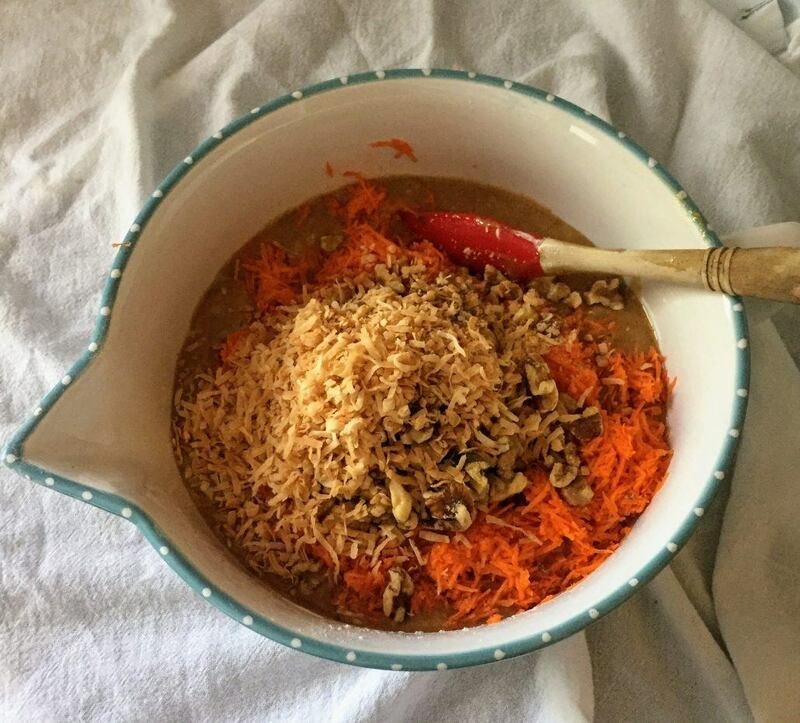 And if you’re afraid of your arm falling off after grating all the carrots, don’t worry. YOU CAN DO IT! 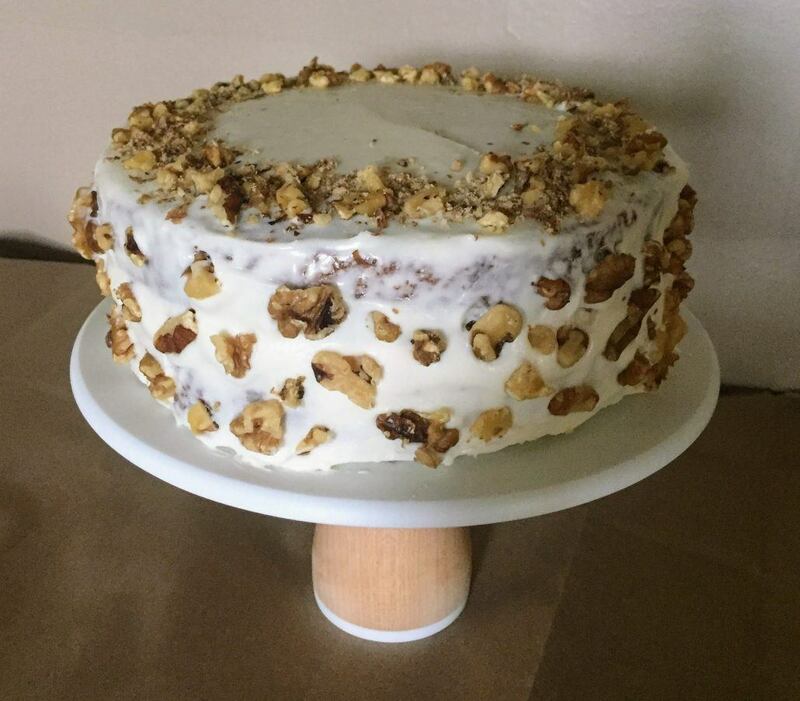 A moist, festive carrot cake covered in cream cheese frosting and walnuts. Preheat oven to 350 degrees Fahrenheit. Spray 2 9-inch cake pans with nonstick pray. Mix sugars, eggs, oil, pineapple, and vanilla until blended. In a separate bowl, mix flour, baking powder, baking soda, salt, and spices until well combined. Slowly add the dry ingredients into the wet ingredients, about 1 cup at a time, mixing as you go. When everything is just combined, stir in the carrots and nut (if desired). Pour the batter into prepared pans and bake for 30-35 minutes. My cake layers were done around 32 minutes. Be sure to rotate them every 10 minutes. Allow the layers to cool completely before you frost them. To make the frosting, beat the butter and cream cheese until no lumps remain on medium speed for 1.5-2 minutes. Add 3.5 cups of powdered sugar, vanilla, and salt, and beat on low until combined. Beat on high for 1.5 minutes until fluffy. If the frosting is too thick, add 1 tsp of heavy cream at a time until it thins out. If the frosting is too thin, add more powdered sugar. You may need to add another 1/4-1/2 teaspoon of salt to balance out the flavor. To decorate the cake, level the layers as needed with a large serrated knife. Because the cake is so dense, this will be difficult, so work carefully. Frost the top of the bottom layer, and then place the second layer on top. Cover the top and sides of the cake with frosting. Decorate sides and top of the cake with toasted nuts. Enjoy, and store any leftovers in the refrigerator for up to a week. 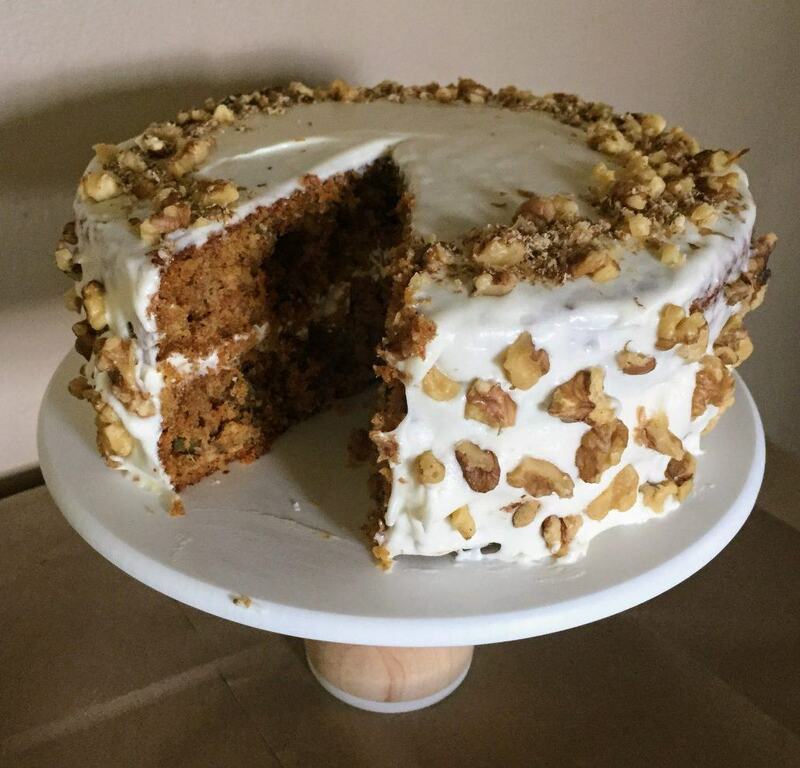 love, love, love carrot cake…you can make this next time you are home…..we miss having you and “Collins” home for holidays too….yeah, I notice when my table isnt full of our kids and significant others….. who knew y’all would stay in Memphis this long? Don’t you miss all us damn Yankees? I do miss some of your baking adventures and experiments…. Love you Bug…gonna try out your Mexican chocolate cake for our associate pastor who grew up as an MK in Mexico….. the country! I do miss you guys, but I’ll see you in a month or two! Let me know how the Mexican chocolate cake turns out! You can use my new favorite chocolate cake recipe https://www.loveandoliveoil.com/2012/01/blackberry-red-wine-chocolate-cake.html and swap out the wine for buttermilk. The spice ratios should be pretty similar to what’s in my #nobannowall cupakes (https://jennythebaker.com/nobannowall-cupcakes/).